I wanted to tell you how AWESOME a job you did on my episode!!! I don't think I adequately conveyed how impressed I am with your work. You ROCK!! I really appreciate what you did. THANK YOU VERY MUCH!!! I am now so overwhelmed with responses, I haven't done a thing on the book or even gone grocery shopping since it came out...yikes! I need to clone myself...cheers..
People find me! People I would never have known have found me through my episode on CIYL. Some have become friends, some have studied with me and gone on to great artistic exploits, some just send lovely adoring messages that spur me on. One of the smartest things I’ve done is film with Graeme Stevenson. Making an episode with Color in Your Life in 2015 was a great way to help develop my reputation as an artist who teaches. I even had locals stop me and say “hey, did I see you on Colour In Your Life?”. Two years later I was able to leave my job and work full-time in my art business. Yay! Four years later, people still get in touch wanting to work with me as a result of seeing the show. I sought a grant and sponsorship and taught a workshop following the show so all my costs were covered within a couple of months. WOW! Thank you so much for all you have done. Since filming CIYL I have had more tutoring opportunities, more exhibitions and have a waiting list for requested commissions. It has been amazing. Thanks for all of this! Loved watching the episode! The cool news is from the social media posts I put in before we went live I sold 2 pieces of art and have 5 commissions and someone has already clicked on my website from the Youtube video and bought a print! Great result!! 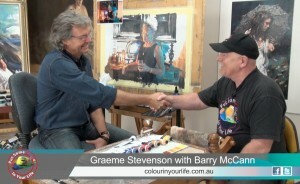 Graeme talks to Barry McCann about his experience with the Colour In Your Life TV series and what it has done for both himself and his wife, Lucy, and their Art practice. A heartfelt testimonial about what a great idea can do for the Art world and for those that are wise enough to take advantage of it as well. Hi, My name is CarrieAnn Therese and I'm a Sculptural Glass Artist in Arizona, USA. Graeme and Sophia came out in the intense heat of August to the Arizona desert to film me in my studio. Despite some concerns with the weather and how it might affect filming, Sophia in her expertise pulled it off beautifully. They made me very comfortable and we had a really fun day together. When it was over, I felt like a child on Christmas night...the time just flew by! There was one other artist in Arizona that was also filmed, and we held a big party at an art gallery, and did a Colour In Your Life Film Premier Night and Release Party, and invited clients, family, friends, the community to view our 2 episodes, see some of our artwork first hand and enjoy a light reception. The show is very new over here and was VERY well received. Everybody that has seen it has been very impressed with the quality of the show. When it first hit YouTube, it was so much fun watching the numbers come in and reading the positive feedback from people, knowing it was being viewed around the world. There's nothing like art connecting us globally! I have already received a number of great opportunities as a result of word getting around about my being filmed for an International Art Series.You just NEVER know what's around the corner, waiting for you to open that door. I'm so glad I did! It was a lot of preparation but a most enjoyable AND worthwhile experience. I would do it again in a heartbeat! By the way...Sophia's editing is pure art in and of itself....she seamlessly wove hours of film into one segment...so beautifully done! Thank you Sophia and Graeme!!! easy and straightforward Graeme and his wonderful team are professional, organised, extremely friendly and genuine. I have every confidence in their ability to showcase my arts practice and help me continue on my artistic path. thankyou. 'It was a fantastic distraction on the 1st anniversary of the death of my father, when I received a phone call from Graeme Stevenson. From the moment I first got involved with the Colour In Your Life team I knew it was the right thing to do! I could feel it! The complete experience, the connections, the aftermath, Wow!!!! Graeme and the team truly made me feel awesome about my work and my life. Who wouldn’t want that? A wonderful opportunity to expose my art and who I am to the world! Filming day – contagiously amusing, flowing with creative energy, and so enjoyable. They couldn’t have made me more comfortable and welcome, the complete package, a combination of creativeness, exploration, self-empowerment and a twist of love!! I have a lot of work in front of me, Commissions! Workshops! Etc. And loving every minute!!!! Happy painting everyone!! I cannot thank the Colour In Your Life team enough for producing a fantastic TV episode featuring myself on the 9th May, 2015. 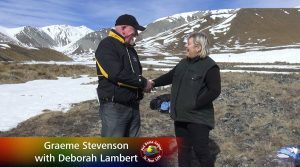 The nerves and anticipation of being in front of cameras on filming day, were put at ease by the friendliness and professionalism of Graeme and Sophia. The end result far exceeded my expectations and so many great comments and invitations are being posted on my Facebook page and website. I totally recommend this Colour In Your Life TV show to anyone who is maybe undecided, just do it, you won't be disappointed! Surprisingly I was unfamiliar with this wonderful programme until Judith Leman sent me an article for the Bulletin of Melbourne Society of Women Painters and Sculptors Society where I am the President and Bulletin Editor. I was fascinated to watch her programme and then was enticed to watch all previous episodes. I always paint on location so was thrilled when Graeme was happy to film me painting at the magnificent Cloudehill Gardens. Graeme and Sophia were thoroughly professional and we had a lovely day together. I have just seen my episode and am so relieved and delighted with the result. I am passionate about painting gardens so am honoured to be able to present what I do on such a highly regarded programme. I thank Graeme, Sophia and Tanita for featuring me on ‘CIYL’ and highly recommend this programme to all artists and art lovers. That's great new's, thank you all for your support. I always promote CIYL and am proud to have been involved in the early stages of production. It just keeps giving. You were the best investment of my life. Thank you for letting me be a part of that. Working with the team from Colour in Your Life was a totally positive and pleasurable experience. From the start, both Graeme and Sophia made me feel very comfortable. Their ideas and comments were so helpful and the resulting show is something that I can proudly direct both my clients and students to. Within a day of first going to air, I had 1000 views and phenomenal traffic to my website along with a multitude of enquiries. My profile has been raised considerably thanks to Colour In Your Life. Being filmed for CIYL was an amazing, extremely rewarding experience. Not only did I sell a good number of works through the show, I received literally hundreds of glowing comments in appreciation, increasing my FB Art page by thousands of new followers. Incredibly, it also lead to me doing an exhibition in Ukraine and an invite to feature in an very prestigious exhibition in Los Angeles. Thank you CIYL, I cannot recommend you highly enough, you have propelled my art career to dynamic new heights! Thank you Graeme and everyone in Colour in Your Life for your professionalism and dedication. I was featured artist on the show and it has done wonders to promote my art. Even after 8 months since my episode was first shown, I'm still getting inquiries. Love you guys. My experience with CIYL was amazing. It was wonderful meeting Graeme and Sophia. Their warm and friendly personalities coupled with their professional approach made the whole day thoroughly enjoyable. Personally, it provided a platform to share my love of pencil, art and nature to a vast audience. The kind and warm response from viewers to my work was quite overwhelming. I have had many enquiries about my work since and have just conducted a workshop filled with new students, all of whom had watched the show. Many others joined my mailing list and I had large numbers join my Facebook page. Not only is the concept of CIYL unique in its ability to share the life of an artist for a day, in a casual but educational atmosphere but it also allows for like-minded viewers to share and network together in an artistic community. I admire Graeme and his team for their far- reaching vision and for making it a reality. I am grateful to have been part of this innovative TV show. I loved the way you snook in the best painting of Pat, thank you for that... I am getting a huge inflated head with all the compliments... YOU NEED THEM!!!! So many people are saying how great all the shows are constructed… very clever. Last night we had model Pat and his wife around for the World Premier showing... in Eastbourne... red carpet treatment, tomato sauce and vinegar and NZ vino, all very sumptuous, you should have been here for the event!!! Thank you to the team at CIYL, my experience was very special and you guys made me so relaxed! I have just sold the cows picture that was one of the paintings on the back wall. My experience working with Graeme Stevenson and “Colour In You Life” proved to be a series of positives, each surpassing the other. 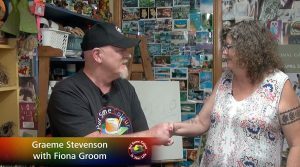 Not only was the planning, filming and production of my episode a thrill, the feedback to me as an artist, and the benefit my business (Art Shed Brisbane and School Art Supplies) has been outstanding. The capital I invested has been the most cost effective means of broadcasting what my businesses and I are about. I recommend Graeme and ‘Colour In Your Life’ to any creative person keen to promote themselves, in an exciting, fun and effective manner. I just finished watching the episode and I am BLOWN away!!! WOW you have made my day... what a wonderul experience it was working with you both. You have made me look like a star and I am blessed to have had this opportunity. As always I will promote the hell out of your wonderful program. Love you guys... now to wait and see what the public think! 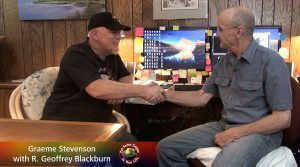 It was a very beneficial step for me to create an episode of “Colour In Your Life” with Graeme Stevenson. Graeme is an enthusiastic, talented artist with a far-reaching vision to promote the talents of Australian artists at the same time as providing entertaining television for the Australian audience. It is a superb way to have my artwork seen by many people with minimal effort on my part. The show has provided me with an excellent marketing tool and it has given me unexpected confidence in my ability to teach. I would highly recommend working with Graeme and using this opportunity for promotion of your artwork through television. Here are some of the testimonials from our wonderful fans. We get some great feedback from people that watch the show, be they artist or art lover alike, and we try to save some of the best. I came across CIYL a couple months back. I have recently had health issues (heart/lung). I have had to stop traveling (I am an IT consultant) and have had many trips to various specialists. Your program and my attempts at my own art are keeping me active and engaged with life. This health-forced slow down has been a trying time. Thanks for all the wonderful artists you bring to us through you program. I am in awe of all of them!! I just want to say that I have learned so much from your videos. I'm... in Springfield, MO USA. Small area with nothing like what you do. I'm in total awe and want to thank you. Graeme, what you are doing for 1000s of artists and would-be artists is beyond measure. Part of why we paint is to touch people on another level and you are doing that possibly more than any other artist ever has. I love the show but even more I now consider myself an artist, whereas before I was a person who did one or two paintings a year. I go to workshops, help a couple of young relatives to go forward and involve my friends with galleries and art discussions. Graeme, I love your show. We have very limited opportunities to learn and do workshops where I live. Your show gives inspiration and insight to other artists work. How they produce their art and give little tips on techniques. Thank you from the bottom of my heart for doing such a wonderful show. Graeme whatever you paint is beautiful. I love the show tremendously, it’s a source of knowledge, inspiration & learning for me. I can re-watch several different favorite episodes a week & still enjoy them every time. Thanks for doing the show, I personally truly appreciate it. Keep up the great work. I live in Sweden and watch CIYL on the net. Your show has made a difference to me and my creativity. I learn, get inspired and practice a lot more than I did before I knew about CIYL. Thank you, and thank you every artist that have shared of wisdom and technics. This opportunity to learn about techniques, creativity in all its forms, and admire talent is a priceless gift. Thank you for inspiring me too! You've changed my life! I can't even get to sleep at night so busy watching your videos! Amazing artists.... I've never been happier!! Thank you! I love the show, its great to see Aussie artists on television, its also good to see something educational on tv for a change. Greetings from Lithuania with love. All your videos are positive and inspiring not only for me but I hope and for artists all over the world :) wish You all the best. This is such a fantastic show. It has made me pick up watercolors! Used to love art when I was in school, but I was too busy to pursue anything related to art after leaving school, especially when I started working. Thanks to this show, I got the motivation to pick up watercolors. "Thanks for producing such a wonderful program, it's like an oasis in the desert. A pearl amidst the banality of TV. For all us frustrated budding artists, it makes us feel that there may just be a light at the end of the tunnel. It is a privilege to watch the marvelous talent we have here in Australia. And Graeme is of course, the "Caped hero" (well perhaps more aptly the "Helmet wearing hero" of Colour In Your Life). His generosity of spirit, gentle personality, and genuine warmth is pivotal in the success of this program, he literally, does take you on a journey. Most TV programs are loud noisy hyper everything!!! When I sit down to watch colour in your life, it's like sitting down with a friend, chatting about what's new and what excited them recently, in the arts, be it movies, art, exhibitions etc. Do keep up the good work, believe me, you have a captive audience!" Graeme, I think you are doing a fantastic work in bringing artists together. I love your manner and genuine interest in people but to me your greatest gift is your generosity of spirit and the way you encourage others to share. So often artists can become "little" in their skills and can hold so tightly to ideas that they forget that life is about giving as well as receiving. Thankyou again for your great show and for being who you are. Featured artist Cheryl Findlay on season 6 - I was fascinated by Cheryl's work and anazed at how much she wanted to share on the CIYL show. I was fortunate to be able to have a couple of private lessons with Cheryl when I travelled from NSW to Melbourne to also visit family. Cheryl was just amazing and very generous, giving and a fount of knowledge with her information. A truly beautiful Artist Person. I teach High School Art in Ohio and recently found your program on you tube. I have enjoyed it and have made it part of my AP Art class. Thank you for doing this, I have always thought it would be great to have real artist's to talk about their work and share it with my students. So this actually has been the closest I can get to it. Thanks again! Hi Graeme,I love the show and feel very inspired whenever I watch it. I am very new to painting really. Took up watercolours last year when I broke my ankle and then started with oils this year. My sister is an artist, Deborah Trusson, she was one of the runners up for the Archibald in 2005, and if I could have half her talent I would be happy. Deb is currently doing her Masters and also started doing Art Therapy, but has deferred for now due to study pressures. It is great to give pleasure to others, so even though we are only small fish in a big pond, you have our gratitude and support. Just want to say that I love your show, I'm a struggling primitive artist who obtains a wealth of inspiration from your show. I Loved the article on Anthony Breslin ! Anthony Breslin has really inspired me on my art work, so well done you guys for putting forward such a fantastic show. Thank you for bringing colour into my love! They were fantastic in terms that it felt like you had made a cup of coffee and were sitting at the back of the artist’s studio watching on. Just wanted to thank you for the hours of interest and entertainment that I get from watching the 'Colour In Your Life ' programmes thanks to Youtube downloads. It's fascinating to see the work of a variety of great artists including yourself of course. As a very amateur senior citizen painter it gives me inspiration and ideas to develop my own modest efforts. There is nothing like it in the UK so perhaps you could persuade UK TV to forget the cooking programmes for a while and get something on that millions would relate to and enjoy. Keep up the good work. I really hope this reaches you, I THINK YOU ARE A STAR!!!! I live in England and I so adore watching your visits, you are inspiring, seeing your enthusiasm meeting all these different artists; it's a magical programme, and I can hardly wait to see the next episodes. If only there were programmes like this in the UK. We have a wealth of talent but our tv programmes have nothing like yours. You are doing fantastic work. My twin sister (who lives in Melbourne, I live in central Qld) and I were both enjoying your Three Amigos recently on Facebook. Loved it! We are both artists and though we are miles apart and haven't seen each other in 7 years it is great to share something special, which is what you have given us. Hi, Greetings from the Caribbean. I wanna thank Graeme for what he is doing for the Art world, not just Austrialia but for us far beyond that. I too have learn so much by following you on Facebook, website and it's the Quality of work that's out there that was hidden from us... kudos to all that's involve. Seeing all these wonderful Artists with their different style and medium display their Talent, invite the world to their homes it's beyond words. As an Artist myself, I have learn and collect so much information from you guys... thank you again for sharing especially with me... Best of Gods blessing as you continue to share this wonderful show ....and remember don't forget to Put Some Colour In Your Life. "I just want to thank you for all the wonderful videos! I have enjoyed every one I have watched and learned so much from all the artists. Out of all the videos I have ever watched on YouTube your are the absolute best and so inspiring! Thanks you so very much for giving us a complete lessons in a video!! You are the best!!!!!" Just wanted to send a HUGE THANKYOU to all the team at Colour In Your Life. I started to watch the show some time back with my father; he has always dabbled quite seriously in all manner of painting and drawing. I have no talent in these areas of art and have long resigned myself to a life of observing art. Thankyou for showing me that art can exist beyond these forms and that anything is possible. You have shown me a new door and the view is fabulous. So love watching these shows, thank you Graeme this inspires me every day to see the diversity of every artists talent, and that I have as much ability and right to paint what I wish and not doubt myself. Love Colour In Your Life, look forward to it every week, there's a lot of amazing talent out there! its good to get a view of other peoples work and get great tips thankyou. Love your shows, you are a Genius Master, Bravoo! Hi to all the Team at Colourinyourlife. Been a viewer since day one. Love it, learnt so much. Always spreading the word. Cheers & a Big thank you. I love Colour In Your Life, I have learnt so much and tried out new techniques learned on the program, just love it. Mr. Stevenson, I just discover your site and I am in love! Thanks for all the information and great experiences your are providing for all the art lovers around the world. I went to college for 16 years, but in a few hours I had more interaction and learning opportunities from wonderful artists, than from many of my instructors, than were to afraid to have someone better than them. Thanks, many thanks! Today I watched your program got out my pencils and pens and did a surreal sketch I never thought I would be capable of thank you to the show and all the artists featured truly inspiring. A lot of my previous ideas were stifling me your show has opened my outlook, thank you all. My favourite tv show. I look forward to seeing it every week. I record episodes, re-watch my favourites and take notes. Love it! Best show on TV - thank you so much to all involved. Graeme - many thanks for your excellent and inspiring programme CIYL - I am a reasonably late starter in the art world but feel true inspiration with this programme and watch it every week - also your net address gives further help and ideas - many thanks it is truly wonderful. Graeme, Colour In Your Life has really inspired me, not just to paint but to redirect my life. 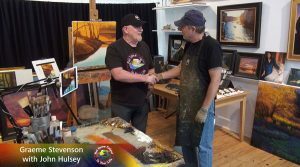 Thank you for wanting to share the "secrets" of painting and encouraging so many other artists to share and giving them the means to do so. Every episode brings the most amazing people & creative talent to us. This one was stunning as well! Would just like to say THANKS! You bring beauty and joy into peoples lives - how great is that. …to bring joy and beauty into people's lives is a true gift and much more than most people ever do with their lives. Love your show I have watched heaps of your video's on Youtube and it has inspired me to start painting again after a 3 year break. Thank You. I've only discovered your show, Graeme. It's transformed my world, helping me back in the saddle after many years of non-creating. Thanks and keep it up. I loved going through your page! Lovely works! Your page brings light and hope into our hearts! I read a beautiful letter the other day a lady wrote about Graeme. See your show, thank you's what you are doing for art in Australia, the humanity in what you do, the lives you touch and enrich. It is amazing. That in itself is a motivating force, to share and promote, I believe in what you do. I think you's and your team are amazing. What a superb program. Educational for new artists, but also very interesting for the casual artist like myself. You have inspired me to go back to painting & drawing my special form of art that took me seven years to design. It combines 45 years of experiences with art for me. So one big thank you to colour in your life! I'm certainly going to take a feather & use it. Colour In Your Life has given me something wonderful, the inspiration to experiment with paint and mediums and to extend myself like never before. I also would like to thank Colour In Your Life for the best program on TV. Thank you for producing such a wonderfully inspiring show too... love your work. This show is one of the very best. It's a "can't miss” and although I record each show I often even watch the repeat on the Sat night. To have access to so many of our Australian talent is simply wonderful. The artistry and sheer range of art styles has been an eye opener. Graeme, thank you and the sponsors for the foresight to see a need and then go ahead and fill that void. Well done. Another painter, from FNQ. I love this program - so informative and fresh. Great art show, just love it, very inspiring. Keep up the good work Graeme and team. I look forward to every episode of Colour In Your Life. Looking forward to all your shows next year, you make my life happier and brighter each week. Thank you so much for all you fantastic programs, encouragement & inspiration to explore & discover the wonderful world of all Visual arts. Thanks heaps for getting back to me. Your show is totally awesome and amazing!!!!! I live for art shows and art and it is fantastic that you have this show. I look so forward to Thursday nights. Wish your show was on every night! It is great that Artists are getting exposure and we are all in awe of seeing all art work and the amazing personalities that Artists have. Quite a few weeks ago, I was just flicking through tv channels and saw you doing an amazing almost abstract style of work. It was so so so beautiful! It was the last minute of your show and you said you were going to make something of it the next week, like bring out the story. Unfortunately I wasn’t home that night and missed it and am heartbroken! As i was in total awe of what you were doing. There was heaps of colour moving around and it looked to me almost like inks floating around and blending together. I am a huge colour fan and love movement and intuitive works. To me this work you were doing was very intuitive, I guess abstract impressionism. My boyfriend told me you were the artist. I was so in awe of your art I wasn’t watching you, but my boyfriend said the guy that hosts the show was doing this. Funny hey, i was so caught up in the moment watching all these colours merging and doing their own thing. Like some amazing kaleidoscope! I could see a woman’s form merging. Wish I could see what you bought out in the end. It was so dreamy! I hope you may put this episode up as i would love to be able to watch it. It is awesome Graeme! Thanks for getting back to me. Have told all my other artist friends about you and your show and we now drop everything to watch your show. Good on You for doing this show! You have many many fans! I've been enjoying your program for several months now, and honestly I believe it's the best "Art" show on the planet! Thank you again! Thank YOU Graeme. It was your article "To be or not to be… that is the question?" That made me realize that someone else gets it. You and your program have been not only an inspiration but a starting point for me in what I hope will be an incredible adventure. I still read those words when I need to. Thank you again for sharing part of yourself and best of luck as you continue your journey. You have put more than colour in my life… you have given me the courage to believe in myself. I love your show… Always tuning in for great tips and inspiration. Fabulous. Great show. Been drawing since I was 5… though gave up as a teen. You have inspired me to start up again… thank you. I will continue watching. Thank you to Colour In Your Life. Thank You Graeme. With your help through posting in Facebook, I made it to my childhood dream of being an artist. No mentor, no formal study, just watching you in YouTube, your show, and my eagerness to be and not to be. I have able to combine my dream and my destiny. Now I paint for donation for my Mission to the Philippines. I founded the QSMI 2 years ago and I used my art becomes a gift to volunteer MD. Now, I have plenty of donors. My Passion has become a Mission. Thank you. I love the variety of talented artist you present. It inspires, encourages and motivates me in my tutoring and painting. Thank you doesn't cover it, but thank you. It’s great to see how other artists work and where their inspiration comes from. I love colour in your life and thank you for bring beauty into all our lives no matter what level of artistic talent we have. I watch it via YouTube… in Texas, USA. So inspiring to see the various artist's techniques. Well done mate! The show has profoundly moved me many times. I get so much inspiration from your shows… Not to mention great tips for my own work. Thanks Graeme, your show’s been a great source of inspiration for me. Love your bike too. Your show, showcases all the awesome talent we have in Australia. The show is just amazing. You are doing a fantastic job, love the show, love seeing all the talent that our wonderful country has to offer. Thank you for enriching so many, and so many more to come. Thank you for sharing with the world the legacy you talk about. It s your strength, passion and foresight which has brought so many people together through your love of art. Thank you for your generosity in sharing it with us. Thank you so much for sharing! I've been inspired and grateful by your show - even though I'm miles away - but it's beautiful to see how art unites us all. Un gran abrazo desde Nicaragua. Brilliant artist and a pleasure to watch! The show has become a staple in my life.... Thank you. You are quite incredible yourself Graeme Stevenson. The art world is so much better thanks to you. You have brought to our homes education, joy and inspiration. So many of us are very grateful. Love your shows and what you are doing. Have watched about ALL of CIYL episodes that I can and have learned a lot from all your shows. Tried to get into a Zburic class in the Apostle Islands/Madaline Island school but landed on a 50+ waiting list. Cannot wait for your shows in the US!! I live in Northern Wisconsin so am in the backwoods so to speak. Good luck to all of you!! I tell my artists friends and art league about you every chance I get! Nigel's episode will be uploaded in the coming weeks. Check out John's episode here. Ruth's episode will be uploaded in the coming weeks. 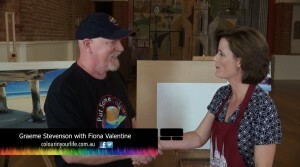 A video testimonial from Colour In Your Life artist, Leisa O'Brien. To see her episode with Colour In Your Life, please follow this link. A video testimonial from Colour In Your Life featured artist Rebecca Brady. To see Rebecca's episode, please follow this link. To see Rebecca's profile, click here. The Business Excellence Award Tweed Shire (BEATS Awards) proudly encourages all visual artists to apply for the Creative Industries category in this year’s Awards. 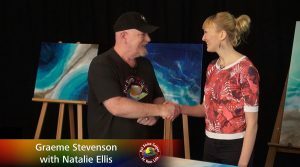 “When our humble art school Artable in Kingscliff won the BEATS award in 2013, we were a rapidly growing local art school with a strong local following. The prize for winning the Colour in Your Life Best Creative Business Award gave won us a feature on Graeme Stevenson’s Colour in Your Life television show. The show immediately catapulted us into the national and international spotlight. This meant we were able to promote our art workshops with local artists and our international art trips to a much wider market. The Colour In Your Life team are a dream to work with and I have no hesitation in encouraging artists to use them as a means to market yourselves and your art to a wider audience. My experience of working with the Colour in Your Life team and the final product has been so positive. It's true to say I was hesitant at first as it's a big leap of faith to let someone else into your art practice and trust them to interpret and edit your story in way you'll be happy with. But really, you just have to spend a few minutes on the phone with Graeme to know that he is genuine about his product and that you're in extremely professional hands. I couldn't have been more relaxed when Graeme and Sophia spent the day here – they both have a perfect blend of professionalism and behind-camera gags to keep the whole process fun and happy. And I think this comes across in every episode I've watched. I'm thrilled with the response from those who knew me, and those who don't, and even have a large commission to work on for a couple in another State which is pretty exciting. It's a wonderful permanent on line CV tool as well, and I know it will hold up well for many years to come. Thanks so much to you all for a great experience. The show is going from strength to strength and I feel honoured to be seen amongst such wonderful artists such as Alvaro and Joseph Zbukvic as well as the lovely McCanns and Ken Done…What a Koo for you…. All your hard work is now paying off and I tell every one that I link to about the show overseas I noticed that when I went to contact galleries in Russia that you were already featured on their sites… How great is that? It has been a wonderful boost to me and I just wanted to let you and all your wonderful team know how grateful I am. Keep on truckin and good luck for the future. Thankyou for all that information WOW… it's so great for you guys and for myself. I have exhibited in Beirut and am in a gallery there now… Have been in touch with a gallery in New York who approached me and am in an exhibition next month Americas museum… in Miami. I have also been approached to be in an art show in Monaco and Spain next July/August 2015. My profile has increased greatly and have been asked to be in an invite only exhibition in Kew Melb in October as well as do a demonstration on the Sunday. Will be talking with AGRA when I go down in October re doing a workshop at sometime over the summer. I have reached over 21500 hits so far and growing on a weekly basis. Have had enquiries about dvds and have been meaning to phone regarding this as I steered a guy to you a while back as I gave mine to close friends and family and he wanted to know if it would be compatable with USA. HOW DO I GET ONTO YOUR SHOP… PLEASE LET ME KNOW AS I WOULD REALLY LIKE TO SELL FROM IT? Will have to update my site soon as I have been selling a bit in Melbourne and Sydney. The info you have given me has given me a real boost and how do I get in to comments to see what people have said of my work. I wish I had it to do over again as I feel I would have more confidence in front of the camera… it wasn’t as daunting as I thought it would be and I am going to do some short YouTube clips on HOW TO... later in the year. I will never forget the experience and cant express enough how grateful I am that you thought me worthy enough to go on your show. I hope you will consider me later in the year but I realize you have many great artists now. I really wish you all the best with it Graeme, an unforgettable experience. My experience with the Colour in your Life team has been astonishing from the beginning. It was a very big decision to go with it, and I certainly thought hard about making such a large investment. I have been delighted with the outcomes thus far (only 9 weeks after my episode aired for the first time). Those who had never heard of me until they saw the show are very keen and excited to learn more of my techniques, and many advance copies of my instructional DVD’s have been ordered. People considering coming to a class or workshop are finding the clip on youtube, and they see straight away if I have what they are looking for. This has resulted in my workshops teaching this technique being booked out solidly until May 2014. I have been invited to teach this technique in many far flung parts of Australia, from Albany to Rockhampton and more. The newsletter mailing list for Arts Tree, where I teach, has increased by 1000%. It took us several weeks to catch up with our overflowing inbox and respond to all the enquiries. Many collectors, having now seen my work, have purchased paintings. In the first month after CIYL aired, 5 large paintings were sold, and that has continued with my current exhibition at The Manly Gallery achieving fantastic sales figures. Many of the enormous opening night crowd were there simply because they had seen me on the show. There have been no negatives arising from allowing the wonderful Sophia, Graeme and Jo into my practice, and I would do it again in a heartbeat. Thank you so much, team! Since my 'Colour In Your Life' episode aired I have had a flood of interest in my work from across the country. The show exposed me to a huge new audience that I wouldn't have been able to reach alone and I still continue to to get emails from people who have seen me on 'Colour in your life' enquiring about sales and workshops. The episode itself is a fabulous promotional and educational tool. Since my work uses a unique process that often requires detailed explanation its valuable to have this great video reference to direct people to so that they can get a deeper understanding of what I do, and how I do it. Hi Graeme, Sophia, Tanita, the production team, and Artists hesitating on clicking on the “Be on the Show” link. I had hovered over that button one day to be on the show and get my name known as a professional artist. But I hesitated. God must have known something because one day after I did not click on the link, Graeme emailed me. I will never look back. Graeme and his team made it all so easy and comfortable and the feedback shows this. After the show went to air, I was inundated with messages that will inspire me for the rest of my life. I will be forever humbled and grateful for the exposure. I intend on Booking an episode every 12 months. Due to the response by viewers, I will be back. I have sold paintings since the air date. Yes that’s a given, but the inspiration that is attached to the show is overwhelming. I never expected the response that I did received from viewers. It was great to know that I wasn’t alone in my creative journey. Most of you will remember the Television show I was featured on a few years ago now... It's called "Put Some Colour In Your Life". Well, the creator of the show - Graeme Stevenson - along with his amazing crew, have now taken the show International. I just received an email the other week from a lady who watched my episode on a Virgin flight from LA to Brissy!!! An artist who is considering going on this show should remember that you will have exposure to a market beyond your Local or Regional or Interstate Gallery and it will be seen repeatedly for years to come!!! Graeme has done so much work - at the disadvantage of promoting his own career - for Australian Artists and continues to do so... He's constantly looking for ways to further promote the show and artists. 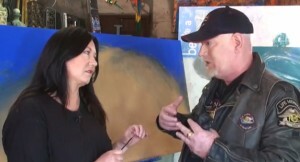 An artist who was recently on the show had commented that she just sold an artwork that was seen on her episode and Graeme's reply was.... "Well the proof is in the pudding guys, now Carolyn is in the mix to travel the globe with the series, so what do you think might happen in the coming years when the rest of the world gets to see the series and all of the Artists as well? I think the penny is finally dropping for most Artists and they can now see that they can have a global audience instead of just a few people wandering in to your local gallery. Well done Carolyn and to all of the Artists that have had great results. The world will now know who you are," Graeme. I sold my painting I did on the show the day after my episode aired after several enquiries - some texts within minutes of the show ending!!!!!!! If you are following me and you are an artist - I highly recommend joining the Colour in Your Life website (family) - it's free and uploading your artwork to share and network with other artist, art lovers and investors of art. Unfortunately, painting is still my third job but one day - and that day is coming - it will be my FIRST priority and Colour in Your Life will be a huge part of that. As artists, we tend to be intrinsic in our thinking and yet we are scattered all over this beautiful country - all struggling along - individually and quite often facing the same hardships, frustrations and upsets. Colour in Your Life is a common ground for us to connect with each other and act as a united representation of our art. I made a huge decision this year to increase the priority of my art as it was delegated to 9pm to 2:30 am a few rare evenings a week. I found a studio to rent and made a commitment to myself to market my artwork as cost effectively and as cleverly as I could as this year was my last chance – before having to dedicate myself to a more reliable and consistent source of income! Becoming a member of the COLOUR IN YOUR LIFE website and uploading my artwork has undoubtedly been the single smartest and most rewarding thing I’ve done for myself and my art. It offers us (artists) a free platform to connect our unique product with an Australia wide and worldwide audience, whilst at the same time, showcasing our work to other creative minds for endless networking and marketing possibilities. As my passion lies in the “thinking” side of creativity, I am greatly impressed by Graeme’s mentality of sharing an insight into the mind of artists. We do think differently to most people but if you look at the ongoing effect that exposing left-brain dominant people to our creative ways, the are winners all round. We can build a better connection and understanding to our prospective buyers (educating your market about your product is paramount to instill it’s value to them) and they can benefit from a wider view on many right-brained concepts and advantages in both their personal and work lives. Finally, I must thank the production team for my TV episode as I saw from the day of filming to the final product –what skill, patience, intelligence and dedication went into the editing and production of the show. The human mind manifests itself in three main forms – thought, feeling and will. I for one believe that this television show, “Colour in Your Life”, appeals to such a broad range of people in all of these ways that it will only grow and grow from here. If you are considering being part of the show or even if you have any benefit to gain from being part of the website artist community- please spread the word. Empowering this show and this online artist community is going to benefit all of us and we can watch the world change a little for the better! Just a note to add- I sold the painting from my episode a day after it went to air, I have been overwhelmed with people contacting me saying how inspired they were and that they’ve started painting again and I even have people booking me in for private tuition sessions later in the year and requests for workshops all around the country! Thank you “Colour in Your Life" and thank you Graeme! I would just like to thank you both for such a wonderful day last Wednesday. Your abilities to create a calm atmosphere makes the process of filming seem more relaxing to those who are not use to it. My family, friends and students are all so excited about the show and we are all looking forward to the viewing. I thoroughly enjoyed my day with both of you and as I have said before and will say again. THANK YOU. Please remember if you are ever in Melbourne and you need somewhere to stay, do not hesitate to give Shane and I a call. “I have had the pleasure of attending quite a few workshops over the years, the majority at the Art Shed. However, this was by far the best one! A Tricia Reust workshop has been on my bucket list for a number of years, as I just love her work. Having Graeme Stevenson there as well was an added bonus as I have admired his work for ages... never thought I would actually meet the man himself! “Tricia Reust’s Workshop gave me the injection of enthusiasm I needed to re-invigorate my own creative journey. “It was an absolutely brilliant workshop - the best I have ever attended! I have been a practicing visual artist for over 25 years, working as a professional graphic designer in the first half of my career plus many involving myself in the Brisbane and Melbourne art scene before moving to my little slice of heaven in the Northern Rivers Region of NSW. This is where I have set myself up with a small Gallery/Art House in the beautiful town of Murwillumbah where I discovered that Graeme Stevenson, a world renowned artist lived only a few streets away. When I saw a Local Newspaper article promoting his ‘Colour in Your Life’ TV series, I knew right then and there that this would be an amazing way to showcase and promote my artwork. Filming with Graeme and his wonderfully talented team has been an amazing experience for my confidence and skills as a professional artist. 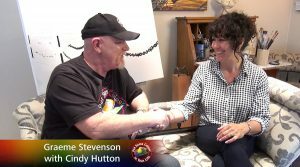 Not only has the ‘Colour in your Life’’ TV show opened a doorway to getting my art shown to a Nationwide audience, the CIYL Website has helped me network and share opportunities to grow my arts business much quicker than I could have imagined. It has definitely been an investment for my future as an artist with ongoing opportunities and exposure for myself and my gallery. It is so great to be able to watch the talent and exceptional skills of the artists we have in this country and the Colour in your Life Team certainly portray our creative artisans in a professional, informative and interesting way with a touch of fun. I would recommend any established or emerging artist to experience this unique opportunity. Just thought it would be remiss of me not to drop you a line, to thank you for including me in the "Colour in Your Life" family. Now that the episode has aired featuring myself and my work, the full benefit of being involved is being realised. As you know I was not comfortable with putting myself 'out there' to that degree, but this was firstly put to rest with the professional way you and you team conducted the interview, then cut and pasted to come up with an episode I am delighted to be quite proud of. The whole concept of " Colour in Your Life " is exceptionally exciting, for the relatively small investment initially to become involved, I am already reaping substantial rewards since the show appeared on TV 4ME. The amazing thing was that it was not shown once but a number of times during the week, and the viewers who have contacted me since caught the program at various times through the week, proving this format really works for the artist involved. The hard work you did attracting sponsors is fantastic. $1500.00 of artist materials from Chroma Acrylics is nothing to sneeze at, the ease of dealing with this company in acquiring the product has added to the whole exceptional experience. On a personal note I would like to thank you for putting this whole thing together in a rare display of total unselfish behavior. An uncommon thing in the 'crazy' Art World we find ourselves involved. Graeme you were an absolute Gentleman to deal with, and anything I can do to help in furthering this endeavor, I am a phone call away. I commend the whole experience to any Artist hesitating at becoming involved. "Put Some Colour In Life"
My experience with the Colour In Your Life team was a great one from the concept of my short film to the actual filming of the episode. What happened next was phenomenal. The web site enquiries came in at a dozen a day and my eBay store completely sold out leaving me painting frantically to keep up with the demand. On top of that people were ringing up about the picture I painted on the episode and now I have been commissioned to reproduce several times! If asked if I would like to be involved with Graeme and one of his projects again, I would reply with an absolute “yes”. Thank you Graeme for your forward thinking and for including me in Colour in your Life.